A 1914 letter written by President Woodrow Wilson from the White House to painter Robert Vonnoh documents one of several enduring relationships forged with Lyme colony artists during the years before his election to public office. When Woodrow Wilson came to Old Lyme in the summer of 1909, he joined a vibrant community of artists boarding at Florence Griswold’s house. Wilson’s first wife, the painter Ellen Axson Wilson (1860-1914), had earlier come to Old Lyme with their daughters in the summer of 1905 to paint among the seasonal colony of artists who flocked to the town. Though he was already a prominent man when he joined his family that summer, then serving as president of Princeton University and shortly to commence his campaign for the Governorship of New Jersey, Woodrow Wilson enjoyed the convivial, casual environment in the Griswold house. 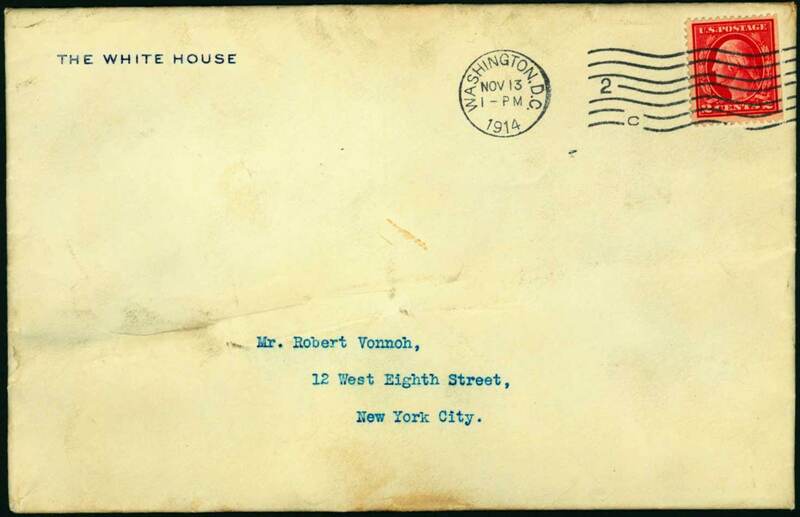 This 1914 letter written on Presidential stationery to the painter Robert Vonnoh (1858-1933) in New York City concerns works made by Robert and his wife, the sculptor Bessie Potter Vonnoh (1872-1955), depicting members of the Wilson family. Sent just months after Ellen Wilson’s August 9, 1914, death due to complications from Bright’s disease, this letter does not express the warm, friendly tone that Woodrow used when writing during happier times to friends from Old Lyme. Bessie Potter Vonnoh (1872-1955). Jessie Wilson (Mrs. Francis B. Sayre), 1912-13. Bronze. Florence Griswold Museum. 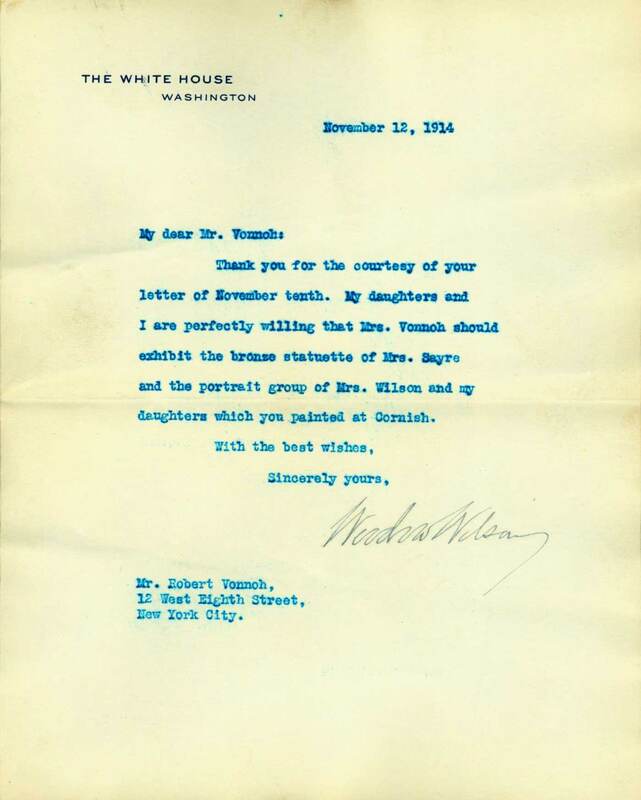 In the letter, President Wilson indicated that he and his daughters would allow their likenesses to be included in an upcoming exhibition. Robert Vonnoh’s painting referenced in the letter is a large family portrait of Ellen Axson Wilson and her daughters Margaret, Jessie, and Eleanor, painted in 1913 at Cornish, New Hampshire (now in the collection of the Woodrow Wilson House, a National Trust Historic Site in Washington, D.C.). 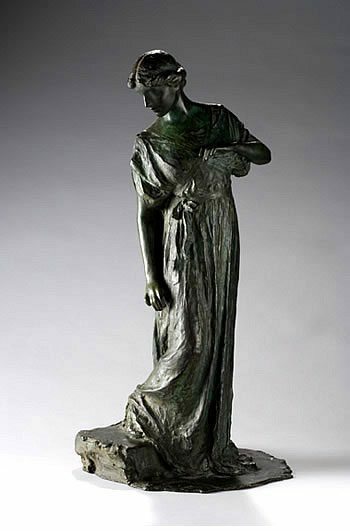 Bessie Potter Vonnoh’s work is a small bronze depicting Jessie Wilson (Mrs. Francis B. Sayre), for which Jessie had modeled in Old Lyme (Florence Griswold Museum 1977.4.2). These works had been exhibited together during Ellen’s lifetime, most recently in December 1913 at the Montross Gallery in New York, and were slated for inclusion in an exhibition at the Art Institute of Chicago from December 1914 to January 1915. Both works can be seen in a current exhibition at the Florence Griswold Museum, The Art of First Lady Ellen Axson Wilson: American Impressionist (through January 27, 2013).